Soft cover. 496 pages. 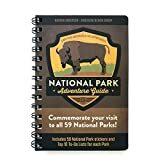 Covers 59 national parks. 300 photographs. 80 colorful maps. Park descriptions & brief history. Travel planning tips. Itineraries. Directions. Activities. Camping information. Weighs 1.5 lbs..
© 2019 | USBooks.com is a participant in the Amazon Services LLC Associates Program, an affiliate advertising program designed to provide a means for sites to earn advertising fees by advertising and linking to Amazon.com.